Why choose organic cotton? Cotton is one of the most popular fibers and one of the most widely grown crops in the world. Yet the conventionally grown variety is saturated with toxic chemicals, and is planted from genetically modified seeds. Its production and cultivation is responsible for 25% of all insecticides and over 10% of all pesticides used globally. One t-shirt equals 1/3 of a pound of pesticides and fertilizers – those are a lot of chemicals to wear on your back!! By contrast, organically produced cotton is grown according to organic farming standards and sustainable agricultural methods like crop rotation and natural pest control. This means that no pesticides, herbicides, fungicides or GMO seeds are ever used in its cultivation. This helps to preserve the soil, air, water and the overall biodiversity of our planet. 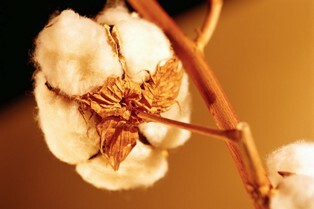 Organic cotton is available in a wide variety of products. These include home furnishings, bedding, sheets, blankets, towels, clothing, paper products, note-cards, and personal care items such as makeup pads, sanitary products and cotton puffs. Not only is this type of cotton more environmentally sustainable, it is a great alternative for people who suffer from allergies and chemical sensitivities. So called “green cotton” is not the same as cotton which has been grown organically. It is still subjected to the same toxic pesticides and fertilizers as its conventional counterpart during the growing process. The only difference is that after harvesting, it is left unprocessed and produced without the use of bleaches or dyes or fungicides. But it is not truly organic. If you are looking for genuinely certified organic products that are pesticide free and produced in an environmentally sustainable way, make sure you know what you are really buying! The organic cotton industry is still a growing industry. At this point in time, it only accounts for 0.3% of the entire cotton industry. Farmers who make the decision to grow cotton organically are generally taking a financial risk, as the cost is initially higher and it takes time to switch from chemically based farming techniques to environmentally sustainable methods. Organic farmers are really some of the unsung heroes of our times, willing to go out on a limb to make something happen that is better and safer for the planet. Yet as more people learn about and buy organic products, the more of a demand for them there will be, which will in turn support the farmers as well as having a positive impact on the planet.